The Villages Woodshop is located at 704 Oak Street, The Villages, FL 32159. From Rt 466: Take Rt 466 East to Rolling Acres Road. Turn left on Rolling Acres Road.Go .5 miles. The Woodshop is right past the driving range on the left hand side. From Rt 27/441: Take Rt 27/441 South to Rolling Acres Road. Turn right on Rolling Acres road. Go .7 miles. The Woodshop is on the right hand side. From Avenida Central, go through the Del Mar gate and take Del Mar to Chula Vista. OR take Morse Blvd to Rio Grande and turn right onto Del Mar to Chula Vista. Take a right on Chula Vista Avenue. Take the next left on to Palermo Place (look for the Valle Verde Postal Station). Go to back right corner of Palermo to cart path and through opening in fence. Take your golf cart to the right on this exit. Follow cart path to driving range parking lot (do not ride on the driving range). Go to far right corner of parking lot and continue to follow the path to the Woodshop. Parking is permissible in front of The Woodshop next to the fence. Small wheel stops are aligned along that area. When this area becomes full, overflow parking is to be on the west side of the shop next to the Shared Harvest garden, again along the fence. 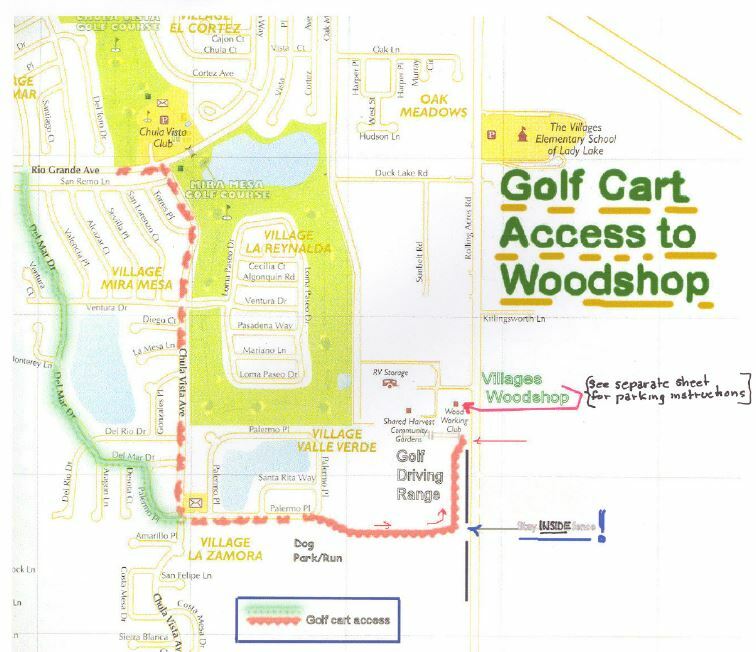 This area is accessed by turning left (west) off the cart path just before the existing parking area, and proceeding to the fence. Park in a manner that doe not block movement of other carts. Parking of golf carts is NOT permitted in the vehicle parking lot. No cart parking is permitted between the path and the front of the building. NOTE: Do not drive your golf cart on the sidewalk!! It is an $80.00 fine and 3 points! Membership in The Villages Woodworkers Club is a recreational privilege of residents* of The Villages, Florida who have completed the necessary information form, paid the applicable fees (see below, Membership Fees), and made arrangements to share in the support program of the Club and Woodshop. You MUST obtain a membership application from the front desk at the Wood Shop building and present the completed application in person to the Woodshop located at 704 Oak Street, The Villages FL 32159, on the corner of Oak Street and Rolling Acres Road (see Map) during normal shop operating hours of 8:00 A.M. and 4:00 P.M. Participate in the work of maintaining the Club and Woodshop (serve as monitor 12 hours per year) or other Board approved function. The one-time (as long as you maintain your membership) Wood Shop fee is applied to the wood shop capital acquisition and improvement fund. This fund is used to purchase new equipment or upgrade current equipment with new features. The annual dues are applied to the on-going operations of the Wood Shop including provision of consumables (glue, sandpaper, etc. ), maintenance of equipment and the building interior, and procurement of new hand and small tools. Exterior facility maintenance is provided by the VCDD as part of the long-term tenant agreement between the VCDD and The Villages Woodworker's Club. Members are required to attend a certification class that is intended primarily to enforce your knowledge of the various machinery available in the wood shop, familiarize you with the safe operation of each major piece of equipment, and to give you a thorough overview of the woodworking facility. Certification classes are held at scheduled times throughout the calendar year. You will be provided with the current schedule at the time you join the club. In addition all members are required to serve as either a Monitor or Tool Crib Operator for a total of 12 hours per calendar year. Each session of Monitor/Tool Crib consists of four (4) continuous hours (a "shift"), either in the morning or afternoon. These sessions will be scheduled at the time you pay your dues. Training for this duty is required and can be done any Wednesday morning from 9:00 to approximately 10:30. A refresher class is required every other year. Because it is s a Club, the life of the organization depends solely on its members and their active degree of involvement in the management and governance. It is hoped - even expected - that the member will take an active interest in the Club and do all they can to help it function productively. It is hoped that you will take it upon yourself to improve your knowledge and skill at woodworking regardless of your entry skills. Basically, you must have a willingness to be involved. The regular meetings of the Villages Woodworkers Club are held on the second Tuesday of each month at 7:00 PM in the Washington and Jefferson rooms at Laurel Manor. Please bring your 'show and tell' item if you have completed something you are proud of and share it with us. We want to know how you did it!!! These items will be displayed for viewing prior to the meeting. We will be taking pictures of the Show and Tell crafts and displaying them in our Gallery on the VWC web site. We strongly support the 'show-and-tell' part of our meeting. If you've made something recently, or even in the past, and would like to share it with us, please bring it. Sharing is what our Club is about. The minutes from current and past VWC General Membership and Board of Directors meetings can be found on the Club Documents section. The Wood Turners special interest group holds meetings on the Tuesday after the General Meeting. the meetings are held at our shop facility and start at 7:00PM. Meetings start off with member presentations of recent projects. each meeting also features a well known turner to demonstrate a specific wood turning technique. The Wood Shop Building is open from 8:00 AM - 4:00 PM Monday thru Saturday. It will be closed on Sundays and major holidays.